As the world has become more connected, globalised and efficient at developing products and emerges shared platforms which reduce the cost of production and provide almost instant distribution possibilities, competition increases and barriers to entry are dissolved. This coupled with a more fickle customer led market who not only seek best in class in products, but exhibit a more conscious and responsible driven buying behaviour, increases the complexity and expectations on companies. As we all ride together on this wave of progression and innovation, the wave it’s more like a tsunami that is wiping out the grounded infrastructure as it sweeps across the world. Moreover, this is not so much a wave as a permanent state change in the world we live in. With the many revolutions humankind has recorded in history, each has changed the identity of the human landscape and reshaped society. Unlike societal uprisings and changes which can happen in parallel as power and the distribution of wealth transforms, economic based revolutions such as the industrial revolution lasted between 100-150 years. Whether you attribute the start of the current digital revolution from the 1950’s, 80’s or 2000’s, we have a long way to go together through these changes. Given this is the world now in which we live and work in, the need to improve our understanding and to better navigate complexity is more important than ever before. We need to explore and adapt faster and alter the way we discover and deliver value through people, systems and relationships. This requires more awarenesses of state and a better understanding of ourselves individually and as a collective, and how we make the decisions to progress and learn. As regularly presented by behavioural economists, us humans are far from rational in our decision making process. Expecting the contrary can lead to devastating effects on society and could easily lead to the demise of any companies future not to mention regression across all aspects of society. I think few will disagree as I write this in April 2018 that the political, economical and societal state of the world is far from predictable or rational. Irrational behaviour can lead to market failure, loss of economic welfare and personal issues such as drug addiction and poor health. Irrational behaviour has implications for formulating economic policy. It means economists need to take into account the potential for irrationality. Taking a closer look into our decision making thought process, according to much psychological research reveals that we have two fundamental functions when making decisions, System 1 (intuition) and System 2 (analysis). In each domain and environment, both systems of thinking can have advantages. Situations that require immediate decisions such as survival would often benefit from speed and this is where developed intuition could be advantageous, consider taking your time to act in chaotic situations such as a fire. The more familiar you are with how to act fast, the higher the chance of your survival; hence why fire drills and training play a key role in conditioning natural responses for such situations. On the contrary situations which are unfamiliar, more complex or variable could be drastically hindered from immediate reaction as the reaction might not be best positioned to survive. In such less familiar states, some analysis would be beneficial to survive or discover the most viable path forward. 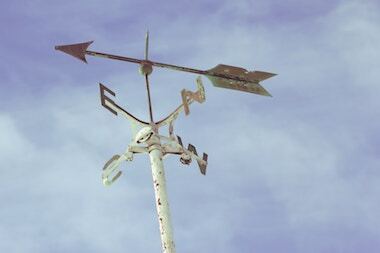 “In real world decision making, sometimes the situation seems unusual or ambiguous. In these cases, the skilled decision maker tries to figure out what’s going on. Once they have some sense of clarity, say by coming up with a story that seems to fit the situation, they get back to the decision at hand. 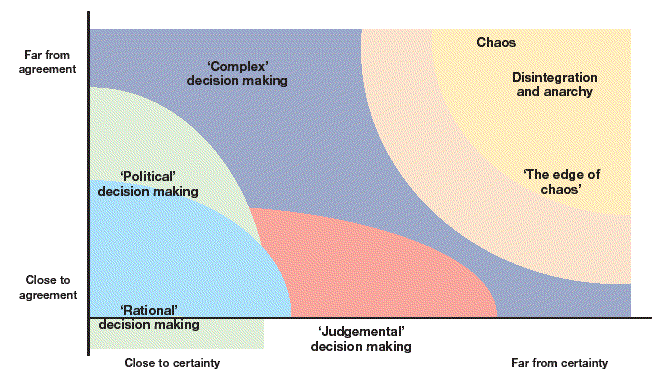 Being able to deal comfortably with ambiguity, uncertainty, and risk, as well as to decide without a complete picture are further examples of critical decision making skills. 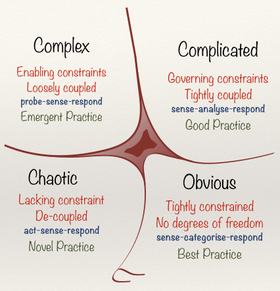 To help support and improve my own analytical decision making capabilities I am a keen advocate and practitioner of decision/sense making frameworks such as Cynefin or The Stacey Matrix, particularly supporting the recognition of domain or environment state. Such frameworks can compliment the application development of decision making skills and provide reference and valuable guidance. On a practical level when making complicated and complex business decisions related to product advancement and innovation, understanding the when and where system 1 and system 2 decisions are being made or not can challenge bias or irrational application is beneficial. This understanding can help align expectations, set appropriate risk levels, structures and funding on projects. This also helps move towards faster learning and discovery over presumed known delivery paths which may form as a result of applying thought on when to utilise and apply to System 1 thinking to System 2 scenarios. 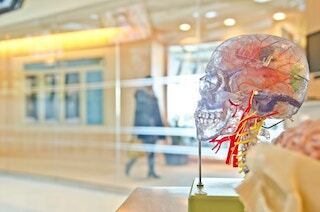 As human beings, we’re fortunate to use our complicated brains in a myriad of ways. When we understand how our brains work, we can gain clarity on the skills that support our thinking, and make better decisions every day. This form of metacognition and awareness can make the difference in the value and impact of our decisions and practices. A useful skill to develop in a world of ever increasing demand on all decision makers surrounding by complexity and change.